That’s the new theme song in our house. We have a new pet in our home … everyone, meet Skittles the Fish. Jake named him that because when we first brought him home, he looked like all the colors in the rainbow. Mostly, he stays this red color that you see in the picture but some days, he changes from red to blue to green. Kinda weird if you ask me. So after a couple of weeks of watching both fish, Jake and I wrote a poem about them. Well, it was mostly me doing the writing but I threw in a line about Jake’s latest joke (I’m sure you’ll be able to figure this part out!). 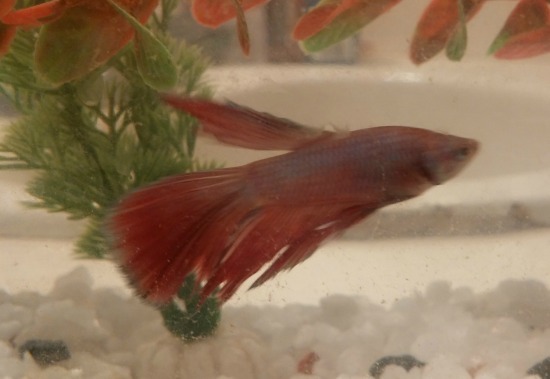 Just to remind you, Fin is the first fish we bought … and yes LARRY at Me, Myself and Kids, he’s still alive. While Skittles watches him swim past. Until their food sinks low. and the blue one is not. he thinks it’s funny but it’s snot. But it’s snot! 🙂 My favorite line! Wow, a second fish. You are living on the edge now! We need an update in about … 3 weeks. Don’t tell me Mr T didn’t say that when he was Jake’s age! Mr. T did say it’s snot -but only cause I say it all the time! 🙂 That line just cracks me up! Yes, I’m 12 years old. Still. A little paranoid there Fox? I still say the fish has a limited life span. Oh and by the way, next time make it a link would ya? Sorry, been distracted … link is up! Okay, I was wrong. I can admit it. Impressive. I suppose you are trying to be funny. Keep working at it. Kidding … but I will keep you posted on our fishy pets. He is an interesting looking fish. I did my best to get a good picture but he kept swimming away.